Clearly, the opening range breakout lost its effectiveness during 2008 and, depending on what type of offset (stretch) method is used, has done so horribly since that it has lost all the money made in 2002-08. Although it may seem natural to suspect the financial market crash in 2008, intuition doesn’t necessarily back that up because the system continued to perform badly after the bull run started in 2009. A more plausible reason is a logistical one. The opening range breakout hinges on the validity of the open, and increased liquidity during the night sessions has rendered the 8:30 a.m. open less relevant. More markets experience a greater portion of their price range overnight. Indeed, most markets that had open-outcry day sessions even a few years ago now trade electronically around the clock. The open does not mean what it did when there was a real pit. However, there’s another option out there. Individual stocks provide a different picture. While not all stocks do well with this strategy, some perform like true stars. These include Apple. 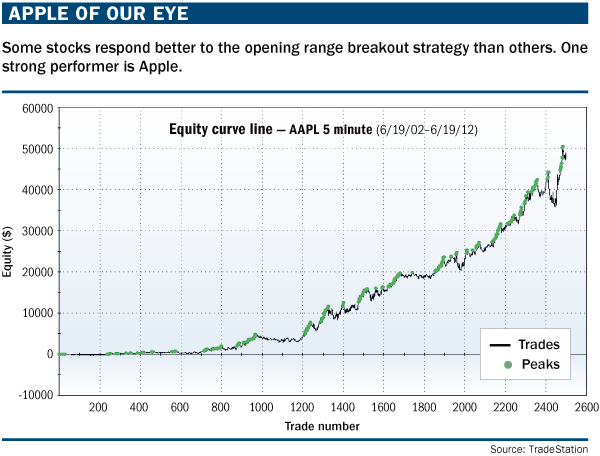 “Apple of our eye” (below) shows the result of the Crabel system with an 85% stretch based on trading a 100 lot. Even though Apple has had a great bull run over the past 10 years, this system has made money both on the long and short sides during this time. Apple is a great momentum stock and breakouts off the open at 9:30 a.m. hold well. The equity curve has a great shape with frequent new peaks. If we look at the yearly breakdown of results, we see further evidence of the strength of this approach, with 2002 being the only losing year. These results suggest that there still is validity to the opening range breakout trading strategy. Interesting areas of study for future articles include honing the breakout identification and expanding the methodology to include baskets of stocks. We also will explore reference points other than the open and new ways of calculating stretch. Some of these ideas also will allow us to alter the technique to various commodity markets that have moved away from the traditional open-and-close concept. The opening range breakout may have a bright future indeed. Murray A. Ruggiero Jr. is the author of “Cybernetic Trading Strategies” (Wiley). E-mail him at ruggieroassoc@aol.com.